I’ve been on a lentils kick lately, I can’t get enough of them. They are healthy, versatile, and so tasty. They are the perfect comfort food. 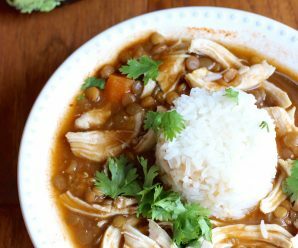 This can be a meal for the entire family, or just you alone, and the leftovers are great too. I ate them the next day while sitting on my couch watching an episode of one of my favorite shows. This dish is simple, but very tasty. Place the oil in a large pot over medium heat. Add the onion, red bell pepper, tomato, garlic, cumin, salt and achiote. Cook, stirring for about 5 to 7 minutes. Add the broth and bring to a boil. 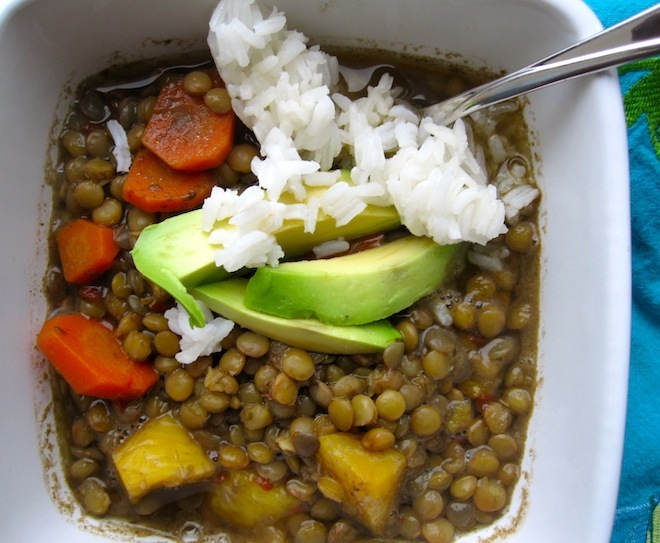 Add the lentils, carrots and plantain, reduce the heat to medium low, cover partially and cook until the lentils are soft about 40 minutes. 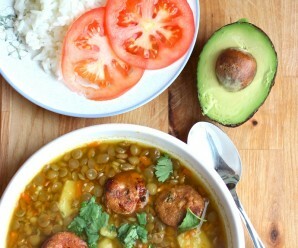 Remove from the heat and add the chopped cilantro and serve with white rice and avocado. Gracias. Cuando me dan ganas de lentejas…me dan GANAS de lentejas!! y esto esta perfecto…tan facil de hacer… gracias Erika y Dios te bendiga! 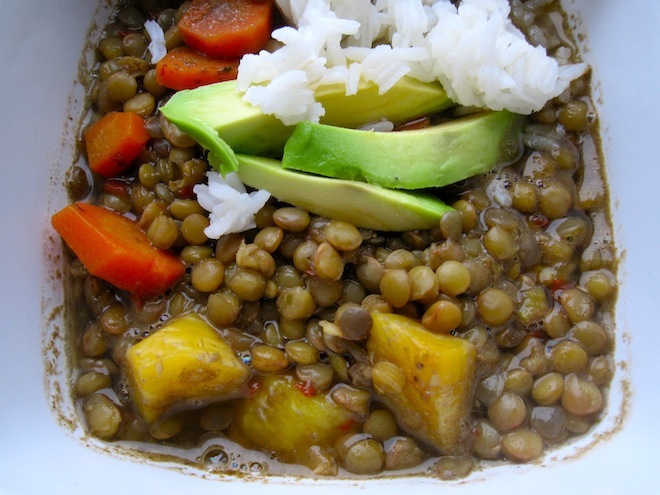 Oo – loving the additions of plantains with lentils – never really thought about it! 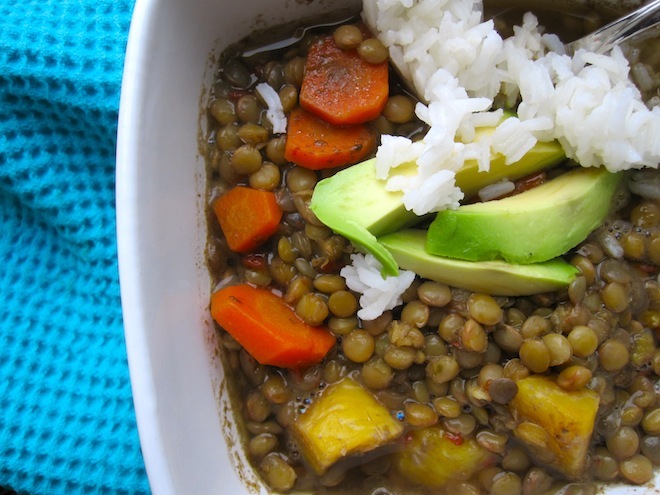 I’m crazy about lentils… AND plantains! This sounds delicious, and I can’t wait to try it. For some reason I don’t cook/eat a lot of lentils. I know they’re great for you and very versatile, but I guess I just haven’t found a good recipe to make them, until now. 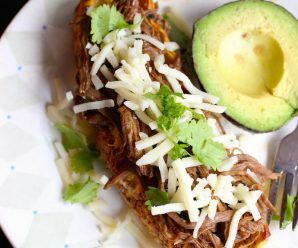 Platano maduro must add a lot of flavor to them, and the avocado… YUM! 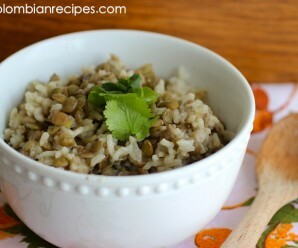 I just had lentils for lunch today! We must be thinking alike. 🙂 Savory dishes with sweet plantains always make me happy. This looks so tasty! Looks so delicious and comforting. Es un plato muy reconfortante me encanta lo preparo igual sin el plátano ,aquí no se usa en las comidas ,pero ahora lo agregaré,abrazos y abrazos. Hi Erika, I’m making this recipe right now…and it smells soooo good. Erica, can you let me know if this can be done in a slow cooker and how would I adjust the time and ingridients?